Support your 2009 Nose Bleed Seats Award winning Promotion of the Year. We dive head first into the action on this cold Sunday afternoon in Danville with a tag team bout between the team of “The Lord of the Ring” Issan Hadeev and his partner for the afternoon, “The Unpredictable” Cyclone. Their opponents for the match were Cecil Cerveza and “Dangerous” Drew Thomas. 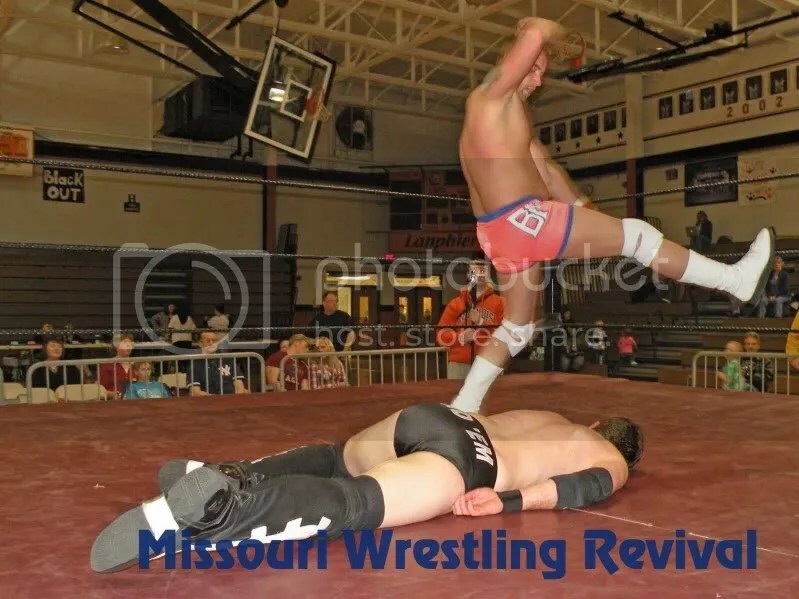 It was a very closely contested match up, and in the end the team of Issan Hadeev and Cyclone were victorious after Issan hit the “Jihad” neck breaker on Cecil while Drew and Cyclone were fighting on the outside of the ring. Following the match, still not satisfied that Issan had gotten what he deserved from the last NBWA event when Drew lost a “First Blood Match” to Issan, Drew issued a challenge to Issan for an “Unlucky 13 Staple Gun Match” to be held on Saturday March 7th at the NBWA’s huge 4th anniversary event. On a side note, Issan is still yet to be defeated in the “Unlucky 13 Staple Gun Match” I believe the record is now 2-0 with wins over Jaxson Pride, and Cecil Cerveza. The second match of the afternoon was the second ever NBWA women’s match and was between “Serenity” (formerly Brandi Harris) and NBWA newcomer Alicia. Serenity improved her NBWA record to 2 and 0 with a win in this match, but it’s worth noting that she had her feet on the second rope for added leverage when she pinned Alicia. After the match “The Fabulous” Jason V. entered the ring and pointed out that he likes to surround himself with excellence, noting that Serenity is undefeated in the NBWA, and “Aaron and Jeff” are the NBWA Tag Team Champions. 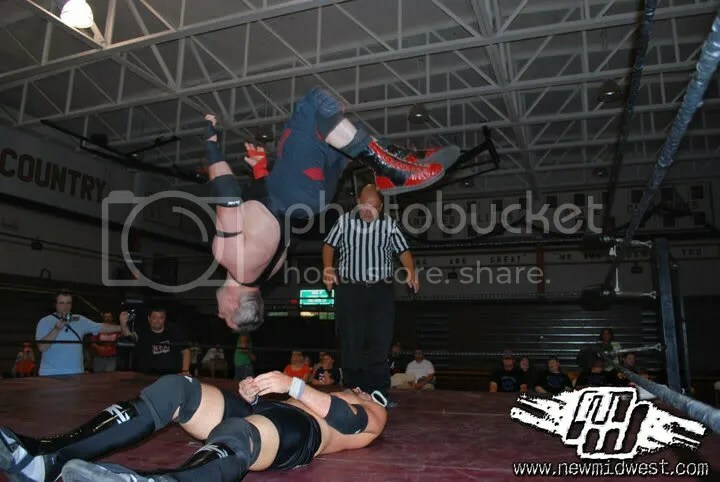 Jason V. also said that he would allow “Bloody” Harker Dirge to be in the NBWA Invitational Battle Royal….IF he could defeat a special hand picked opponent later on in the show. Next up for the afternoon, NBWA Lead Council, Jonathan Castle made his way to the ring to inform NBWA Mid-West Television Champion, Eric Ruffington that since he saw it fir to boycott the “Pick Your Poison” event on Feb.7th, Mr. Ruffington would not only have to compete in the karaoke competition that the fans choose, he was also going to compete in a dance competition, AND a wrestling match against Cheapshot Mcgrot. First up was going to be the singing competition, but before we can get started Mr. Castle introduces us to the 3 hand picked judges for the competition. The first judge is Marvin, the owner of the NBWA gym, and the maker of the worlds best nachos! The second judge is NBWA ring announcer The Lovely Miss Amanda. The third judge making his long awaited, surprise return to the NBWA….former NBWA Heavyweight Champion…”The Strangler” Diego Corleone! In the first phase, Cheapshot McGrot sang the song “I believe I Can Fly” made popular by R. Kelley, and received good reviews from both Marvin, and Miss Amanda, but Diego made a comment something to the likes of the song sounding similar to the sound artificially inseminating sheep. I apologize for not knowing the song Eric Ruffington performed, but I do remember he didn’t impress Marvin or Miss Amanda, but got a stellar review from Diego. The second phase was the dance phase of the competition, and Cheapshot McGrot did the “Soldja Boy” and again received good reviews from Marvin, and Amanda, but of course Diego had something negative to say, something to the effect of reminding him of a fat stripper, who needed to have a bag pulled over her head. Then it was Ruffington’s turn to dance and to start off, he said he was going to need a little help from a couple friends, then Aaron Matthews and Jeff Harris came to the ring to help him with the dance made popular by the Saturday Night Live cast, Chris Kattan, Will Farrell, and Jim Carey. Marvin and Amanda didn’t care too much for the dancing, but Diego gave it favorable reviews. So now onto the wrestling match between Mr. Ruffington and Cheapshot. 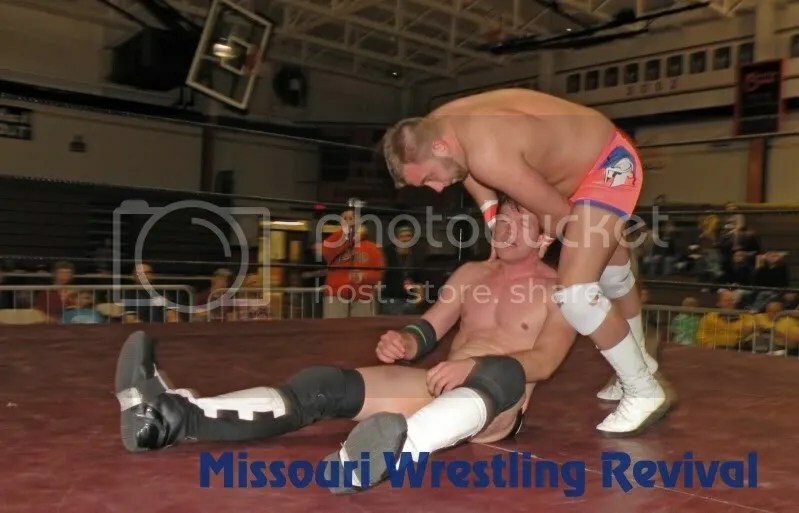 Ruffinton was in control for much of the match, and almost ended the match with a European Sleeper hold, but Cheapshot was able to hang on. 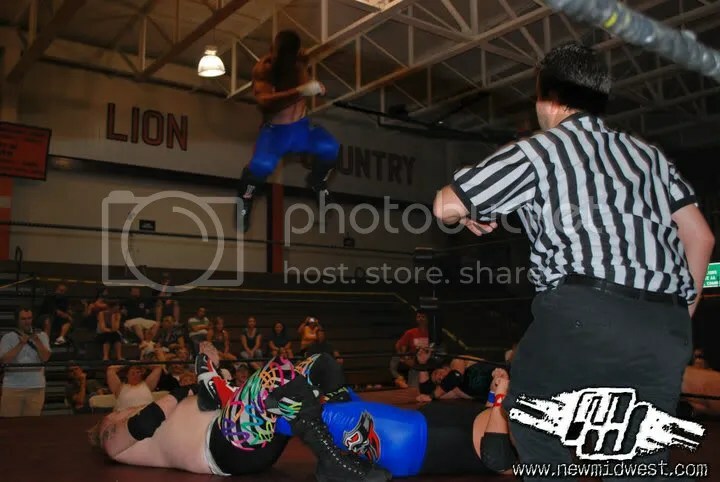 Cheapshot eventually took the upper hand in the match and was going to the top rope for his signature diving headbutt when Diego, who was still sitting at ringside jumped up from his judge’s seat and pushed Cheapshot from the top rope, disqualifying Ruffington from the match. Keep in mind though, a title does not change hands on a DQ. After the match was over Aaron and Jeff came to the ring and assisted Ruffington and Diego in the onslaught on Cheapshot. 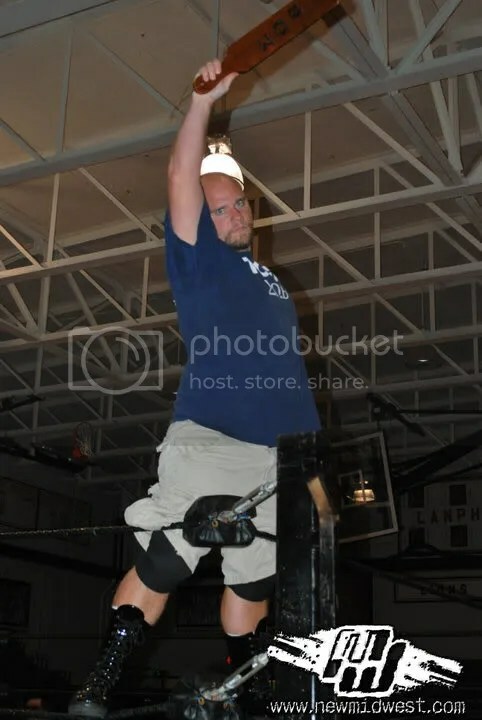 Luckily for Cheapshot help was on the way in the from of Heritage Wrestling Coalition Champion, “Bloody” Harker Dirge, who’s appearance alone cleared the ring. As Ruffington, Matthews, and Harris all exited the arena, Diego got the mic and announced that he wasn’t just here for judging this competition, he was here to face off against BHD as Jason V.’s hand picked opponent, and what better time to begin that match than NOW! So the match between “Bloody” Harker Dirge and Diego Corleone begins, with Harker’s spot in the 2nd Annual NBWA Invitational Battle Royal on the line. This was a great match by the 2 former champions and the match came to a conclusion when referee Carley Rae was inadvertently knocked out, and Diego, ever the opportunist went to the corner of the ring and retrieved BHD’s chain and attempted to use it, but Harker was able to make him miss, and then used the chain himself and delivered a shot to Diego’s throat, and went for the cover. 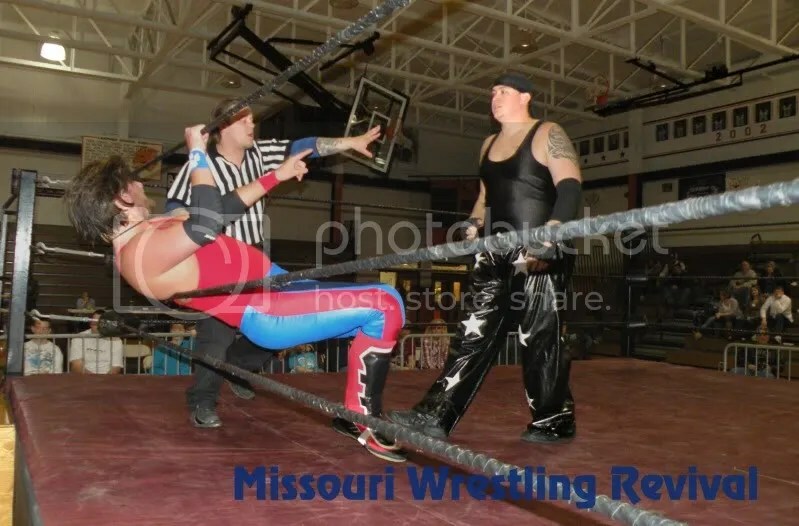 By this time the referee was coming to, rolled over, and administered the 3 count. 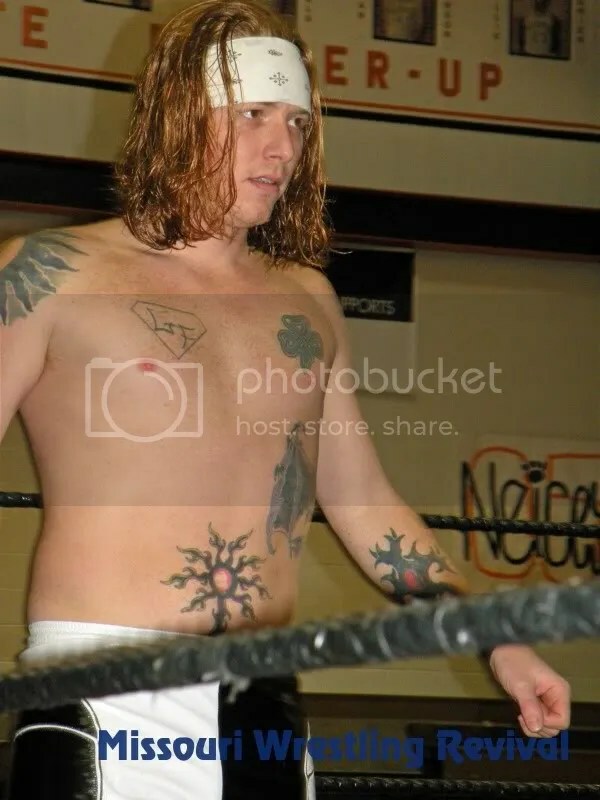 After a brief intermission, we dive head first back into the action with a match between Nicky”The Weasel” Mankotti and “The Catalyst” Corey Carter, who is making his first appearance back in the NBWA since the NBWA event on May, 24th 2008 when he participated in a “Gauntlet Match” against Harker Dirge. This time though Mr. Carter fared much better in the NBWA ring, gaining a pinfall over “Weasel” following a reverse back breaker. Next up for the afternoon was a NBWA Tag Team Championship match between the champions, “Aaron Matthews and Jeff Harris, and their opponents were D’Andre King, and Vic “The Pitbull” Santelli, otherwise known as “Encore”. This was a great back and fourth match between the champs, and the #1 contenders. Jeff and Aaron had D’Andre isolated for much of the beginning of the match, but when Pitbull entered the match he was taking care of business. In the end though neither team was awarded with a victory. As D’Andre, Jeff and Aaron were fighting outside the ring, Pitbull climbed to the top rope and dove onto the 3 men outside, and this eventually led to a double count out. The next match has been the center of much chatter for the last couple of days since the show. It was between the team of Eric Ruffington and his partner for the afternoon was Morbid, who was accompanied to the ring by Alicia and their opponents were Joey Grunge and Dan The Man. Grunge and Dan the man had much of the match going in their favor, but towards the end of the bout Eric Ruffington left his partner Morbid to face both Grunge and Dan all alone, and that is when things fell apart. Morbid hit the mat, and had been pulled out of the ring by his Alicia. Referee Chad Tally who had been sitting at ringside noticed things didn’t look quite right and ran to check on Morbid, apparently Morbid told Tally he couldn’t feel his arms, and Tally motioned that he needed medical assistance for Morbid. Then the announcement was made asking all the fans in attendance to please go outside while Morbid was being tended to. While the fans were outside it became know that there was nothing wrong with Morbid, and that he had faked an injury because he in fact was an untrained wrestler, that didn’t know how to handle the situation inside the ring, so he tried taking the easy way out of the match and faked the injury. Just minutes after being asked to leave ringside the fans, not knowing what was going, on were allowed back into the arena, and the show was allowed to continue. 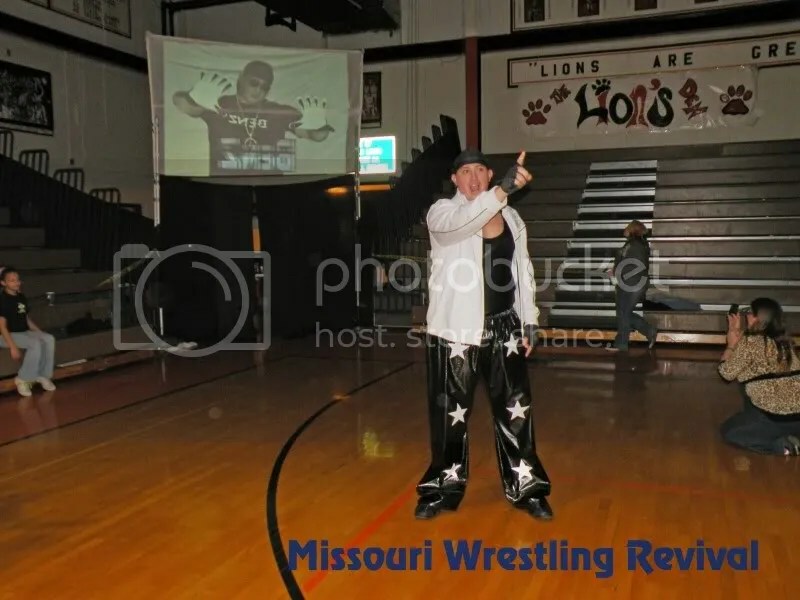 Finally, we have come to the main event of the evening, the NBWA Heavyweight Champion “The Fabulous” Jason V., who was accompanied by Serenity, putting his title on the line against wrestling legend, Tracy Smothers. It was a slow and methodical beginning to the match, as Jason V. tried to size up his much larger and stronger opponent. To Jason V.’s credit though he was able to go toe to toe with the ring legend, using a number of wrestling holds to wear down Smothers. In the end though, it wasn’t any wrestling holds, or maneuvers that won the match for Jason V. It was the help, yet again of the crescent wrench that we have seen used for the last 2 events. 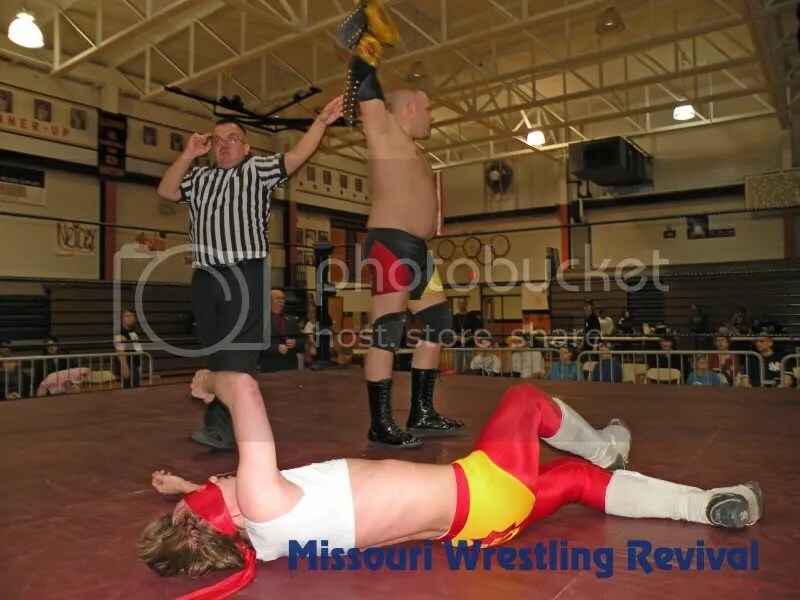 This time, while the referee was distracted by Serenity, Jeff Harris slipped into the ring and delivered a shot to Smother’s head with the wrench. When referee Carley Rae turned around, all she saw was Jason V. covering Smother’s and she counted 1…2…3! Winner by pinfall: “Fabulous” Jason V.
After the match HWC Champion, “Bloody” Harker Dirge came to the ring to aid the fallen legend, but Smother’s who quite literally…never saw what hit him….was confused with the situation, you see when Smothers came to, he saw BHD holding a wrench in his hand and had thought it was Harker who had dealt the blow to him. After some convincing from the crowd, Tracy seemed to accept the fact that it was NOT Harker who had hit him, and the two men shook hands. But just when Harker least expected it, Tracy took the wrench that Harker had still been holding, and gave Haker a vicious shot to the throat with the wrench! Before he left the building though, Tracy was sure to insult all the fans in attendance that afternoon, the he got back in his helicopter and flew back to Tennessee. 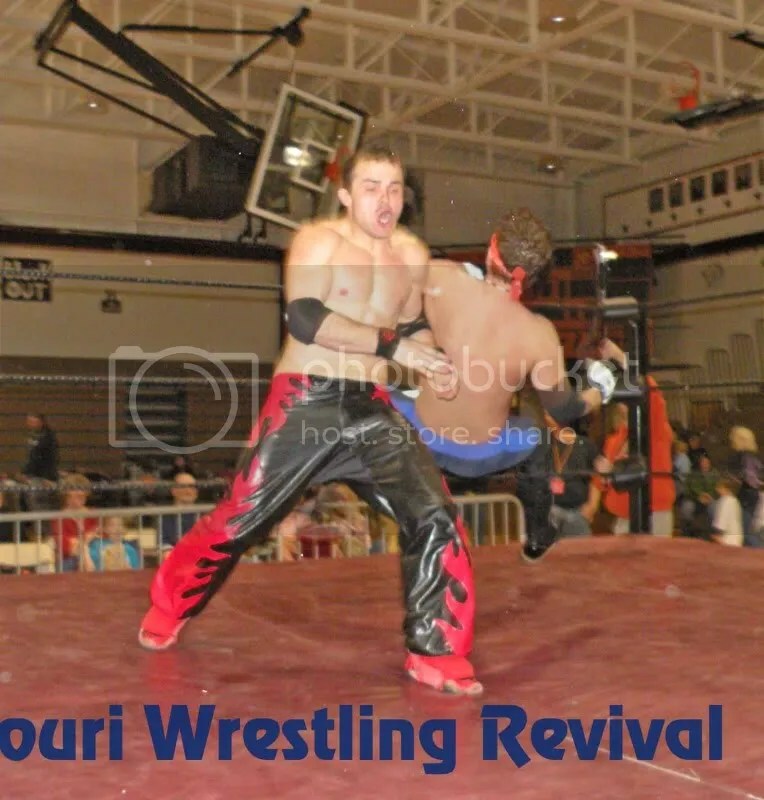 First and foremost, THANK YOU to all the loyal NBWA fans that came to Danville on Saturday to support the NBWA. Without your support and devotion there would be no NBWA, so thank you to you all! 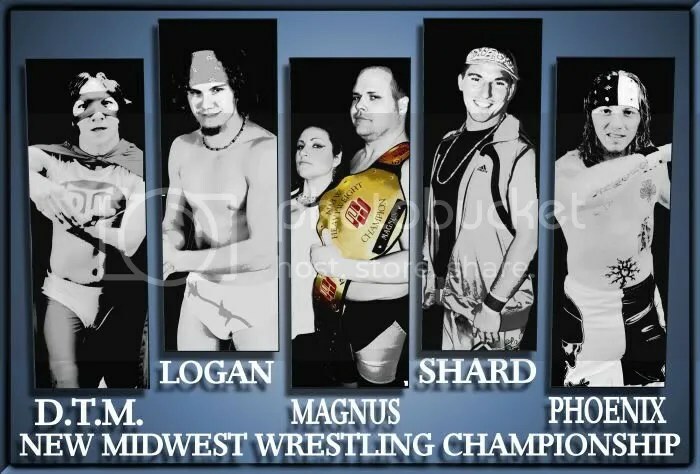 As we are set to kick off “Pick Your Poison” we are informed by The Lead Council to the Board of Directors, Jonathon Castle that the NBWA Mid-West TV Champion, Eric Ruffington is boycotting today’s show, due to the fact that the NBWA fans had chosen for Mr. Ruffington to face off against Cheapshot McGrot in a karaoke competition. So,wrestling Cheapshot McGrot this afternoon was Cecil Cerveza. To begin the match Cheapshot demonstrated to Cecil how to do his trademark hand jive, but after that, the fun and games were over with. It was a hard fought match between the NBWA veterans but in the end Cheapshot was victorious. Winner by pinfall: Cheapshot McGrot. 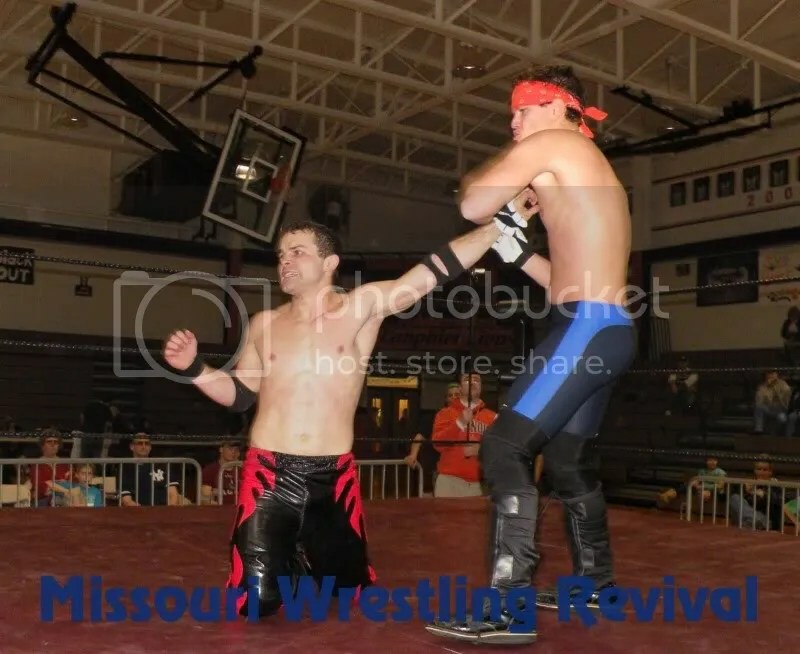 Next up on the agenda was a tag team match between the team of Wild Bill and Nicky “The Weasel” Mankotti against “The Frat Pack” which was the team of Gavin Alexander and Jonathon Napier. With their new attitudes in tow, Alexander and Napier are looking to take the NBWA tag team division by storm! There seemed to be a few miscommunications during the match for Gavin and Napier, eventually causing “The Frat Pack” the match. Wild Bill ended the match when he pinned Gavin following a frog splash. 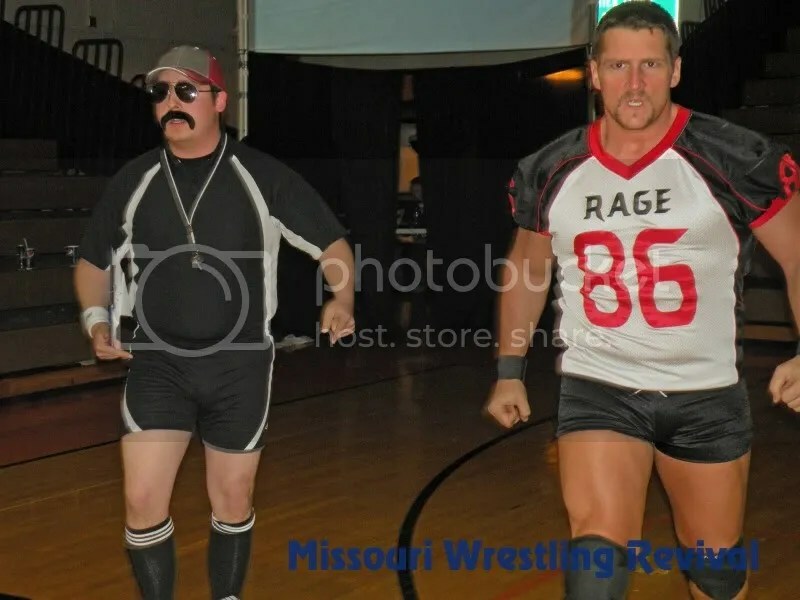 Winners by pinfall: Wild Bill and Nicky “The Weasel” Mankotti. 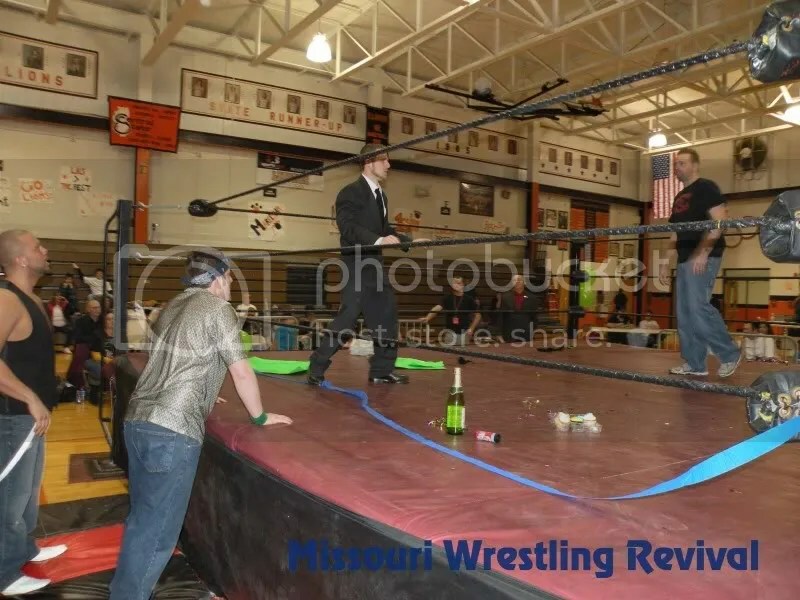 Following the match after Gavin and Napier had left ringside, Bill and Weasel were celebrating their victory when who should appear but Aaron Matthews. It looked as though Matthews had something he wanted to discuss with Wild Bill, but as Aaron had Bill’s attention Jeff Harris attacked Bill from the backside. This wasn’t just an attack, it was evident that Harris and Matthews had every intention of putting Bill out of action by trying to take out his shoulder. Just when it looked as if Wild Bill was done for, ‘Bloody” Harker Dirge had come to the rescue. BHD had chased Harris and Matthews out of the ring, and in their haste someone had forgotten their tag team title belts, and now Harker Dirge was in possession of the belt. Following the melee Miss Amanda announces that the new NBWA Heavyweight Champion “Mr. Fabulous” Jason V. was going to be making his way to the ring accompanied by Serenity. Jason V. makes it known that the NBWA will be keeping in last years tradition with an invitational battle royal to celebrate the NBWA’s 4th anniversary. Today though, we will be getting a small taste of the battle royal with the winner of today’s battle royal being granted with the final entry in the HUGE invitational Battle royal on March 7th. 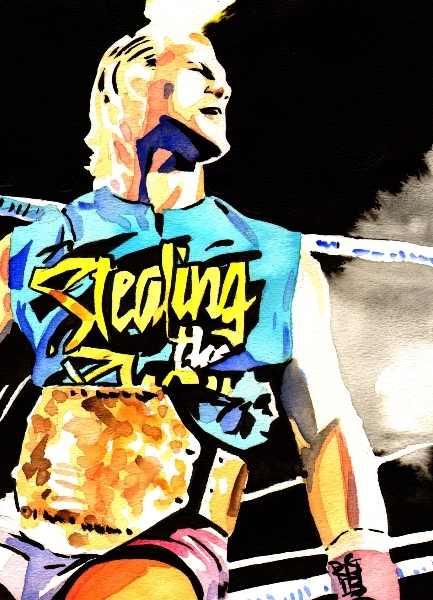 With that being said, let the Battle Royal begin….. The opening participants are DaCobra and “Dangerous” Drew Thomas, who are followed by “The Unpredictable” Cyclone, Aaron Matthews, Jeff Harris, Angelo Santelli, Nicky “The Weasel” Mankotti, Serinity, Issan Hadeev, Cheapshot McGrot, “The Prime Cut” Nick Cutler, Vic “The Pitbull” Santelli, Wild Bill, D’Andre King, “The Apex” Blake Steel, Gavin Alexander, Cecil Cerveza, Christian Rose, and Anderson Rhodes,. When the dust settled the final two combatants were Angelo Santelli, and Aaron Matthews, the two former members of “The New Breed” stood face to face for a moment, and then all hell broke loose as the former allies tried to tear one another limb from limb, but in the end Angelo sent Aaron Matthews over the top rope for the win, and the final spot in the invitational battle royal to be held on March 7th, with the w inner being guaranteed a NBWA Heavyweight Title shot. 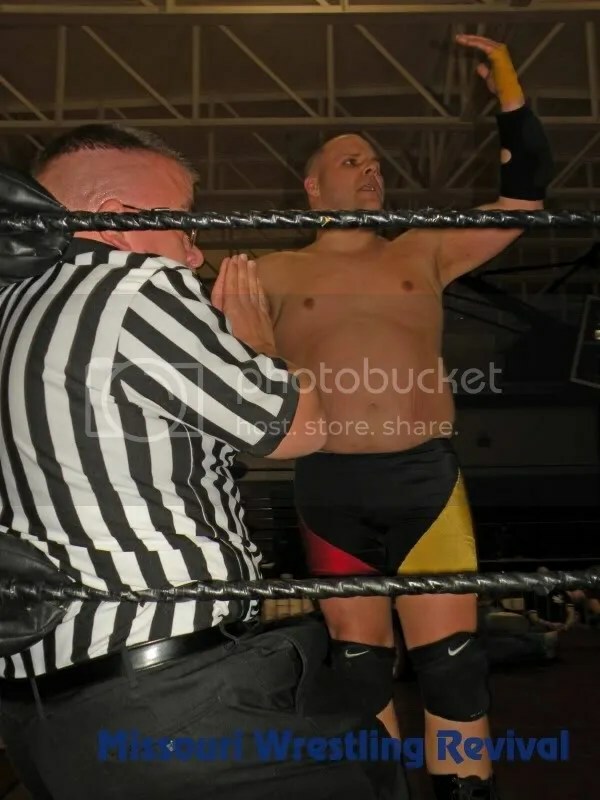 Following the match Santelli made it know that he was the most decorated champion in the NBWA, and the only title that had eluded him over the years was the one title in Jason V’s possession and he was coming after it! The next match of the afternoon was a “First Blood Match” between “The Lord of the Ring” Issan Hadeev and “Dangerous” Drew Thomas. With this match being a no DQ match we saw the use of many foreign objects such as Issan’s flag pole, a chair, and a staple gun. In the closing moments of the match involved Issan Hadeev repeatedly stapling the forehead of Drew Thomas causing his head to bleed and thus ending the match. Winner by first blood: “The Lord of the Ring” Issan Hadeev..
After the match had ended something inside Drew Thomas head snapped he viscously attacked Issan and the two former members of “Dangerous by Design” brawled inside the ring and out. Members of the security staff tried to separate the two but to no avail as the y brawled their way into the locker room area. 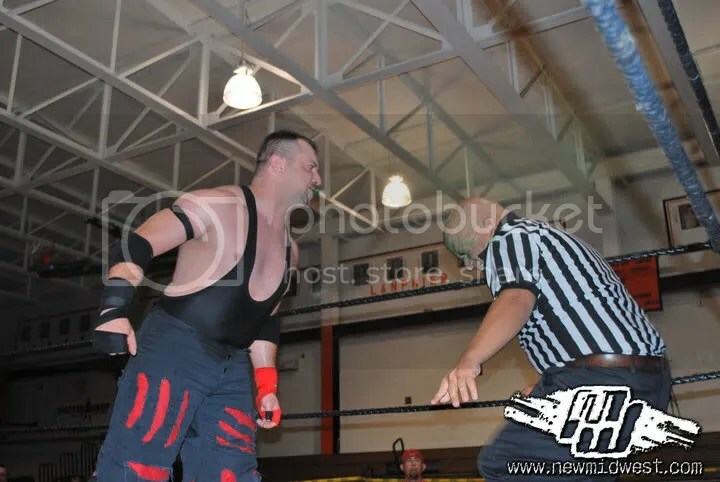 The fifth match of the afternoon was another match that was chosen by the NBWA fans for “Pick Your Poison” and was between the team of the newly crowned NBWA No-Limits champion “The Prime Cut” Nick Cutler, and the man he defeated for the=2 0title on Jan.11th “The Apex” Blake Steel. Their opponents, who won the fan polling was the team of D’Andre King and Vic “The Pitbull” Santelli, otherwise known as “Encore”. 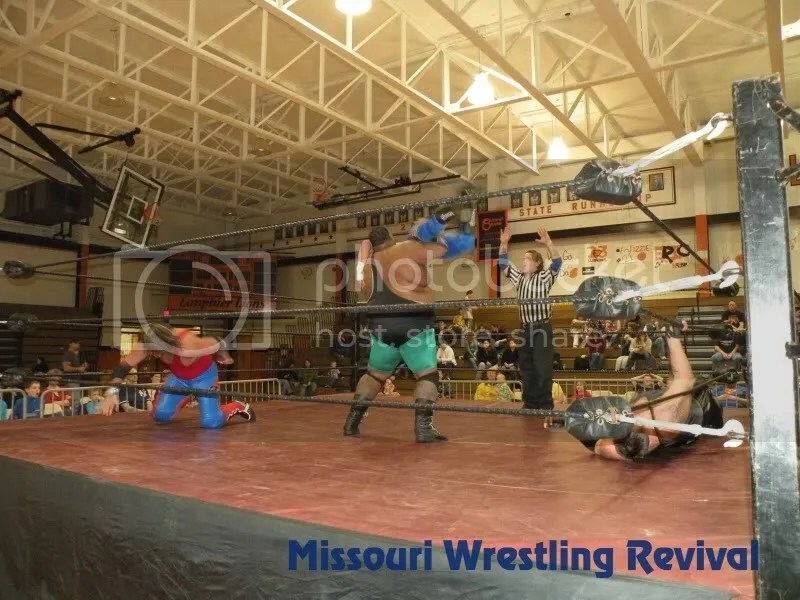 It was evident from the get go that the team of Cutler and Steel were going some trouble putting their past match behind them. You could hear Cutler throughout the match tell Blake Steel “I could have done it better”. 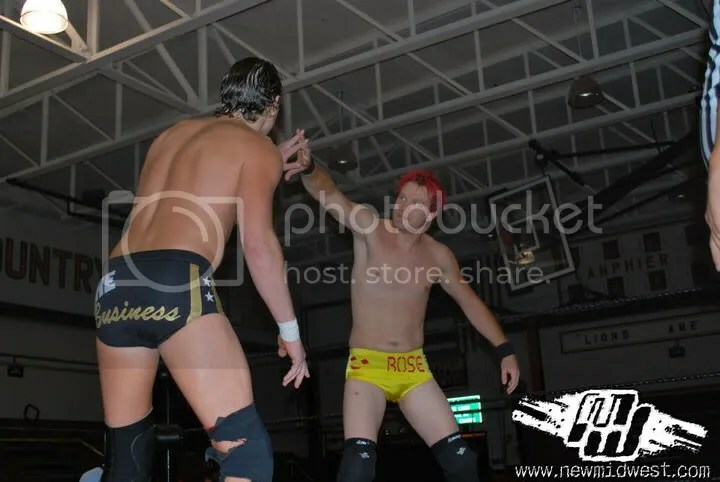 Nick Cutler wasn’t the only one who had a problem with Blake Steel during the match up, Anderson Rhodes also had issues with Steel after Blake had told Rhodes to go back to the locker room during the match, and Rhodes promised that Blake would have to deal with Eric Ruffington when he returned to the NBWA next month. With all the bickering within the team of Cutler and Steel, it was just a matter of time before the team self destructed. 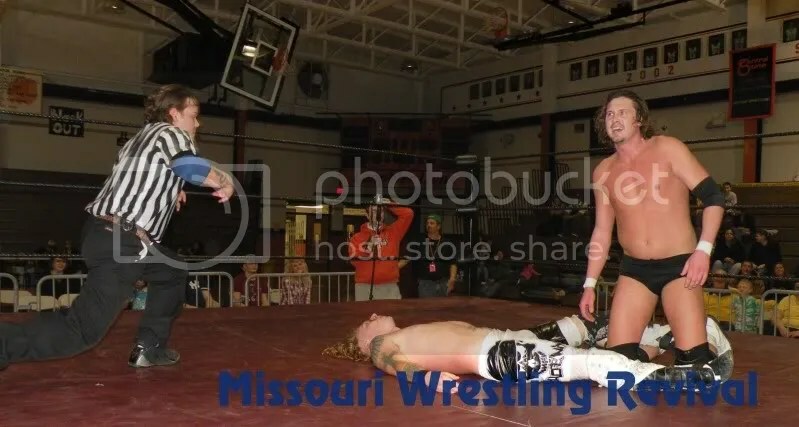 I the closing moments of the match it looked as though Blake Steel was going to pull of the win, but Cutler entered the ring and delivered an “Un-prettier” to Blake Steel and then draped D’Andre King over Blake’s lifeless body for the 3 count. 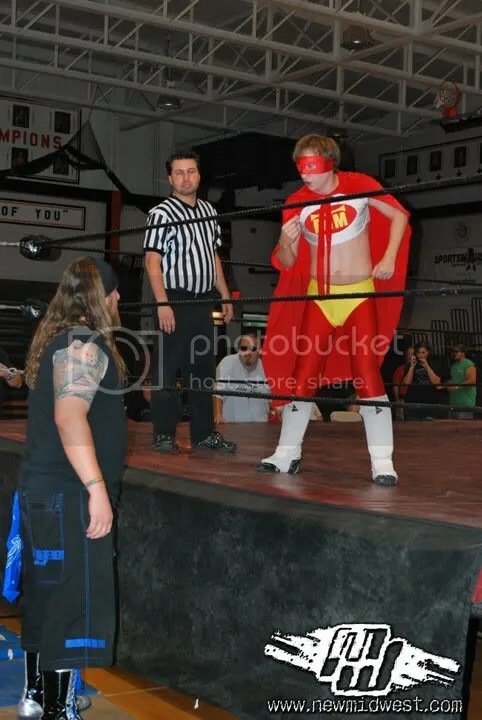 The next match of the afternoon was the match between the 2008 Alberta J. Murray Memorial Tournament Champion, Da Cobra vs. “The Unpredictable” Cyclone. This match was al so a “Pick Your Poison “match and the NBWA fans had chosen for this match to be a “ Caribbean Rules Match”. Apparently the rules for this match were chosen at one point or another by Cyclone himself, and decided it would be to his advantage to keep the rules of this match a secret until the rules had to be enforced. The one rule we did know at the onset of this match was that there were two weapons in opposite corners of the match, and they may be used during the match up. But, there were certain conditions…. They may only be used for 30 seconds, a bell would be sounded at the beginning of the time period, and a bell would be sounded at the end of the time period, and if either participant was still holding the weapon at the sound of the second bell, that wrestler would be disqualified. There would be 4 of these periods within the 15 minute time limit for this match. So after the lengthy explanation of this rule the bell sounded and Da Cobra hit Cyclone square in the head with a roundhouse kick and went for a cover and got the 1..2…3! BUT….. “The Don” Kato Morales chimed in from his position at the announce table, and read from the list of Caribbean Rules that there were no 3 counts, you must pin your opponent for a four count. So the match was restarted, and we saw 2 of the weapons periods come into play, the first, Cyclone used a chair shot to20the midsection of DaCobra, but was only able to get a 3 count. Some time went by and the action had now spilled outside the ring when the bell signaling a second weapon period sounded and DaCobra had used a cookie sheet to deliver a knockout blow to Cyclone outside the ring, and a referee Carley Rae administered a 10 count, BUT….yet again “The Don” interjected himself and let everyone know that in a “Caribbean Rules Match” that in order to be counted out, it must be a 20 count. 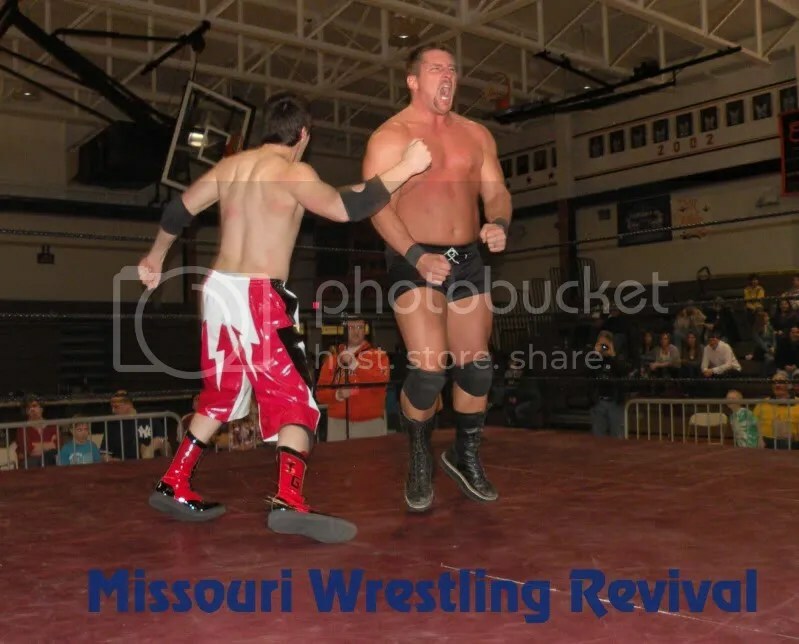 But by that time Cyclone had recovered and re entered the ring. So the match continued until a point where DaCobra had thrown Cyclone over the top rope, and Cyclone’s entrance music began to play, at first everyone had thought it was a malfunctioning sound system, but yet again ‘The Don” announced one more of the undisclosed Caribbean rules, and said that if anyone was thrown over the top rope, it would lead to a disqualification. So Cyclone was officially announced as the winner of the match. Winner by disqualification: “The Unpredictable” Cyclone. Now, the time had come for this afternoons main event. A Handicapped tag team elimination match between “The Fabulous” Jason V. and his partners, the NBWA Tag Team Champions” Aaron Matthews & Jeff Harris, who were accompanied by Serenity. 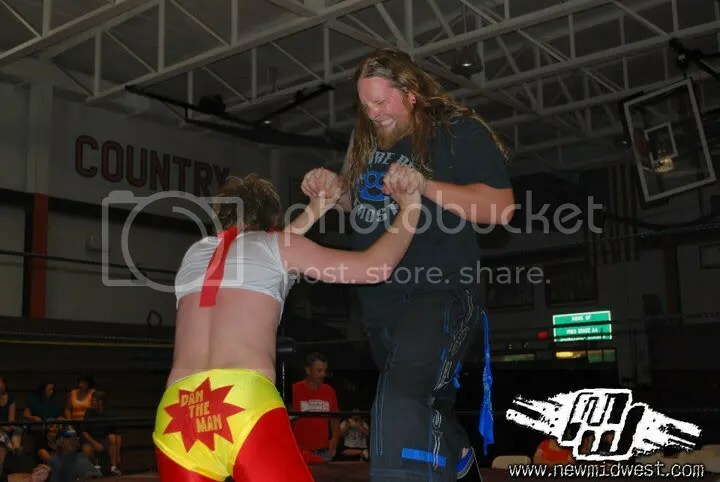 Their opponents for the afternoon were The Heritage Wrestling Coalition Champion “Bloody0 Harker Dirge, and the partner for BHD was chosen by the NBWA fans through the “Pick Your Poison” poll was former NBWA Tag Team Champion Noon Moon. 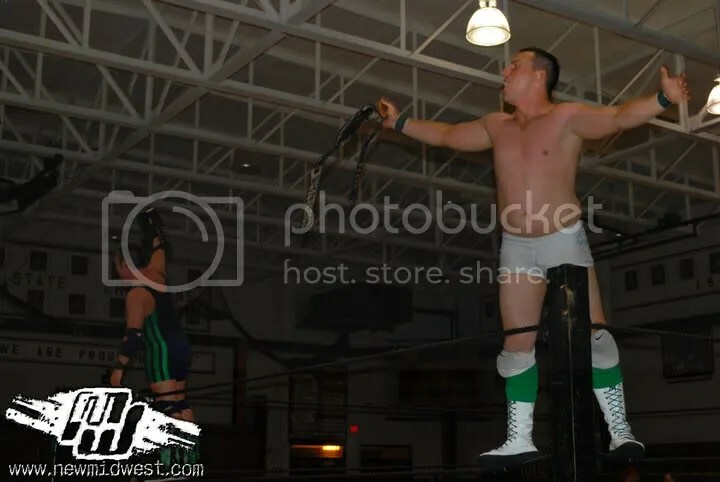 As a last minute stipulation to the match it was announced that if BHD or Noon Moon pinned Jason V. they would become the NBWA Heavyweight Champion, and if Aaron or Jeff pinned Harker Dirge, they would in turn become the new HWC Champion. So now with all the stipulations in place, the bell sounds and the match is under way. The team headed by Jason V. had the upper hand throughout much of the opening part of the match, as the team executed many quick tags to keep a fresh man in the ring as they wore down Harker Dirge. Eventually Harker would tag in Noon Moon to get the fresh man in the ring against the trio of champions. 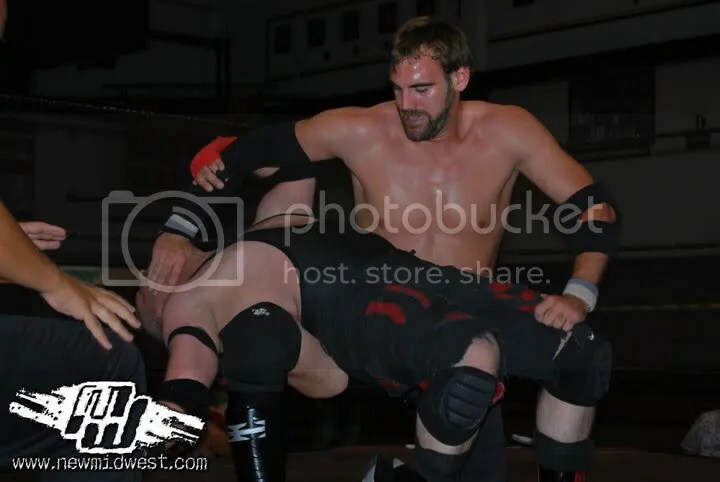 The match went back and fourth for some time before it came down to BHD and Jeff Harris in the ring as the legal men when harker was able to lock in his patented Dragon Sleeper, “The Dirt Nap” and Harris had no choice but to tap out. Now the odds were all evened up with 2 men on each side of the ring, that is until Harker Dirge had a momentarily lapse in sanity and retrieved his chain from the corner of the ring and used it to knock the sense out of Aaron Matthews, and gotten himself disqualified. Now Noon Moon was all alone against the team of Aaron Matthews and Jason V. Noon Moon used Harker’s mistake to his=2 0advantage though covering Matthews for the 3 count. Now it was down to Jason V. and Noon Moon. An angry Jason V. attacked Noon Moon and soon removed the mask, and the face behind the mask this time was none other than Angelo Santelli! The two NBWA vet’s fought back and fourth and as the match continued “The Don” had slyly gotten up from his seat and stood at ringside. In the mean time Serenity was walking around the ring cheering on Jason V. when “The Don” passed a huge crescent wrench off to the young lady. In the mean time, Angelo had been setting Jason up fir the “Sky High”, but Serenity had reached out to Jason V. and passed off the wrench and V. who had used it to knock Angelo’s lights out. All this was unknown to referee Chad Tally who had his back turned away from the action trying to keep “The Don” out of the match. When Tally had turned back to the action all he could see was Jason V. on top of Angelo and laid down a 3 count. Winner by Pinfall: “The Fabulous” Jason V.
That just about wraps it up for this edition of the NBWA. Be sure to mark your calendar on Sunday, February 22nd for the next NBWA live show, featuring legend of the ring Tracy Smothers as he returns to the NBWA! The action will get under way at the New Breed Gym, located at 400 Sager St. in Danville, IL, with the opening bell set to sound at 2:00. To begin the show, Jason Vendetta makes his way to the ring and demands a rematch against DaCobra, who had defeated Vendetta on Dec. 6th for the Alberta J. Murray Memorial Championship in a Ladder Match. Vendetta claimed that he was screwed out of his trophy by special guest referee Angelo Santelli. 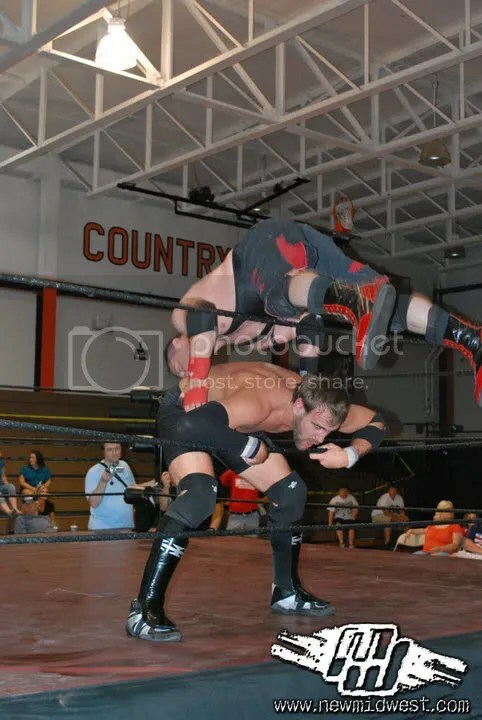 Santelli delivered a “Sky High” spine buster from atop the ladder on Vendetta, but only after Vendetta used the banned flipping pile driver, “The Detenator” on DaCobra. The Lead Council to the Board of Directors, Jonathon Castle said that Vendetta was not going to get a rematch, and furthermore DaCobra hadn’t even arrived at the arena as of yet. So, in a show of protest Vendetta sat in the middle of the ring and said the show would not start until he was granted his rematch, but Mr. Castle assure Vendetta that the show WAS going to begin! Lovely Miss Amanda announced the first match of the afternoon as being for the NBWA Mid-West Championship, and would be the champion, Wild Bill accompanied to the ring by Brandi Harris vs former NBWA Heavyweight Champion, Eric Ruffington. Ruffington and Wild Bill, not knowing what to think of Vendetta still sitting in the middle of the ring began their match. During the opening moments, it was clear that Vendetta wasn’t going to leave the ring after Bill and Ruffington locked up, and Jason Vendetta was caught in between them, in frustration, Bill threw Vendetta out of the ring, only to have him return and reclaim his spot in the center of the ring. 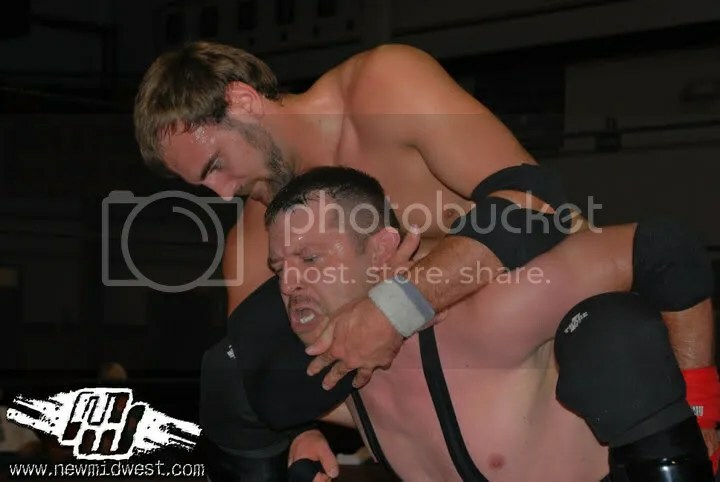 Bill and Ruffingon continued their match trying to wrestle around Vendetta but that proved to be easier said than done. In the end, Eric Ruffington was the winner of the match(with a little help from Jason Vendetta)and the new NBWA Mid-West Champion! Winner by pinfall, and new NBWA Mid-West Champion Eric Ruffington! Following the match, Vendetta reitereated that he wasn’t leaving the ring until he got his rematch! Who should come to the ring but NBWA Heavyweight /Heritage Champion, “Bloody” Harker Dirge! Harker says that he, like the NBWA fans are tired of listening to Vendetta’s whining and said that since he didn’t have an opponent lined up for the afternoon, and wanted to get a paycheck this week, he challenged Vendetta to a match. The second match of the afternoon was a Gauntlet Match featuring Issan Hadeev, with a special stipulation that if Issan lost against any of his 4 opponents he would have to sing The national Anthem. Issan’s first opponent was Jordan “Shorty” Vandel, who was making his NBWA debut. Unfortunately for Jordan, it was a short lived debut, Issan had won match #1. For match #2 Issan’s opponent was Christian Rose, who was also making his NBWA debut, and just like Jordan, didn’t last very long against an angry “Arabian Assassin”.Match #3 for Hadeev was against Nicky “The Weasel” Mankotti. Weasel fared far better than the two previous opponents, but ultimately it was the same result, Issan had beaten Weasel in the 3rd match with “The Camel Clutch”. Finally Issan Hadeev’s 4th opponent for the day was “Da Best Kept Secret” D’Andre King. This match was the most competative of the gauntlet, it started out with Issan and D’Andre testing each others strength, and then they took turns with running shoulder blocks, but neither man would budge. We saw a couple of big suplex’s from D’Andre, and both men each hit a spinebuster on the other, but in the end Issan was victorious in match #4 following a “Jihad” neckbreaker. The next match of the afternoon was the very first NBWA women’s match, featuring Brandi Harris vs Jessika Haze. It was a great match for “Little Sis”, considering she won the match, but it was the aftermath that everyone was talking about . After Brandi’s big win in her debut, Wild Bill joined her in the celebration and in a real shocker, Brandi dropped to her knees and nailed Bill with an uppercut to the groin, and then got on the mic and told everyone what a looser Bill was! Up next, Mr. Castle came back to the ring to make the announcement that due to Simply Divosi’s broken clavical that he suffered in an ATV accident over the holidays, the NBWA No-Limits Championship was going to be up for grabs in this next match. 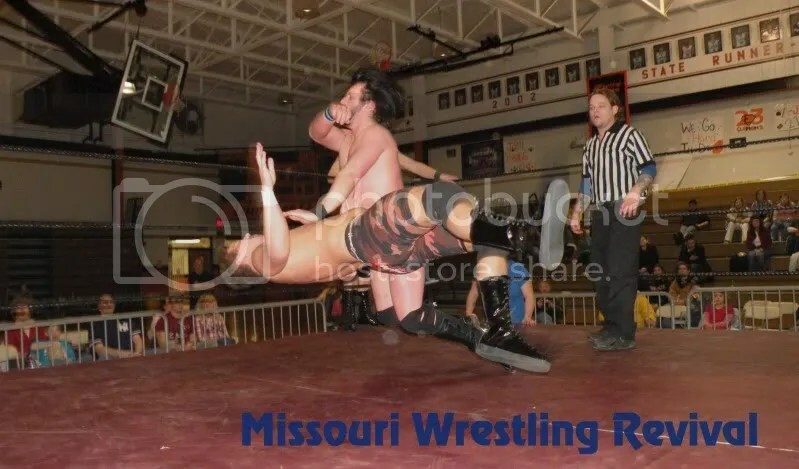 The match was between Nick Cuttler, and “The Apex” Blake Steel. 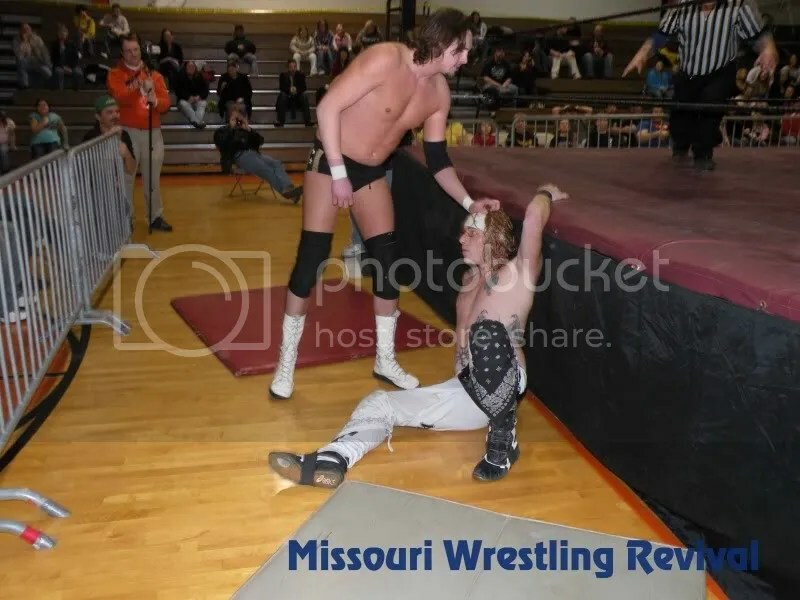 Steel made his way to the ring preceded by Anderson Rhodes, and Eric Ruffington, but what came as a shock was that Blake had asked Anderson and Eric to leave ringside, Blake said that he wanted to win the title on his own. This pleased the crowed, who was rather oddly cheering for Blake for the entire match. And what a match it was, it saw both competitors get near falls, and multiple submission holds. In the end Nick Cutler was victorious! After a short intermission, we get back to the action with a NBWA Tag team Title match between “The Worlds Greatest Masked Tag Team” vs the team of Jeff Harris and Aaron Matthews. It was a fast paced, action packed match that saw yet another betrayal. 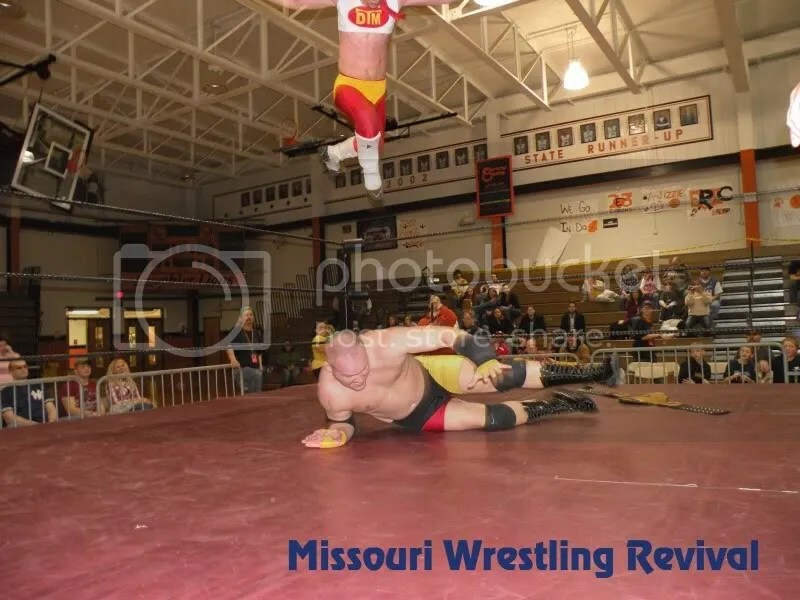 During the closing moments of the match, a fatigued Cheapshot McGrot was attempting to make a tag to his partner, but Cyclone refused the tag, backing away from the corner, signaling that he wasn’t getting in the match leaving Cheapshot to fend for himself. 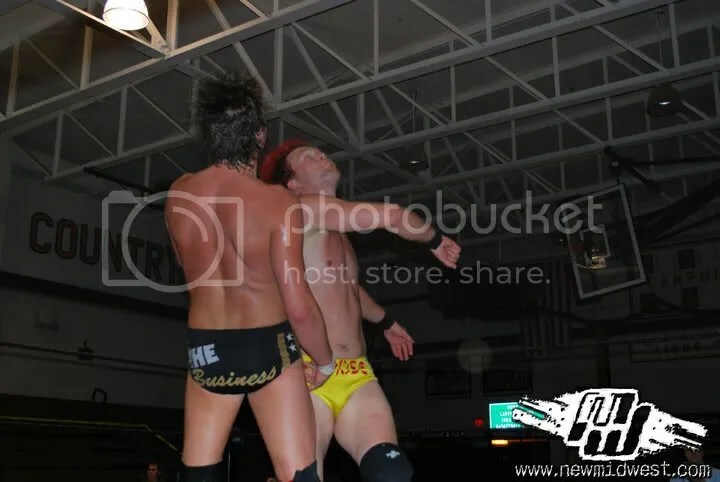 “Jeff and Aaron” then won the match when Aaron Matthews hit a Shooting Star Press on Cheapshot and then got the 1..2..3! Next up was the debut of “The Japanese Nightmare” Kahagas, and hi opponent was the 2008 Alberta J. Murray Memorial Champion DaCobra. For those who didn’t see this match you missed a vicious man in action, you can see why Kahagas is called “The Japanese Nightmare”, it not often that you see DaCobra manhandled the way he was in the opening minutes of the match, literally being tossed around like a ragdoll! Following a brief timeout from DaCobra to regroup he re entered the ring using his speed and quickness to combat Kahagas rather than strength. The rest of the match featured quick kicks from DaCobra, and Kahagas always seemed to match DaCobra kick for kick. One advantage Kahagas had was his sickening chops, he must have hit half a dozen bone chilling chop on DaCobra during the early goings of the match. In the final moments of the match Kahagas had DaCobra in the far corner of the ring, and hit a massive headbutt the the chest, and then began to unleash yet another series of vicious chops on DaCobra when DaCobra hit the mat and rolled Kahagas up in a small package for the 3 count. Following the match the NBWA crowd gave Kahagas a huge round of applause and chanted “Please Come Back”. Finally, for the main event of the evening, it was the NBWA heavyweight Champion “Bloody” Harker Dirge vs “#1” Jason Vendetta, who was being accompanied to the ring by “Serenity” who we had previously know as Brandi Harris. During the early goings it was all Harker Dirge, that is until some help showed up for Jason Vendetta. 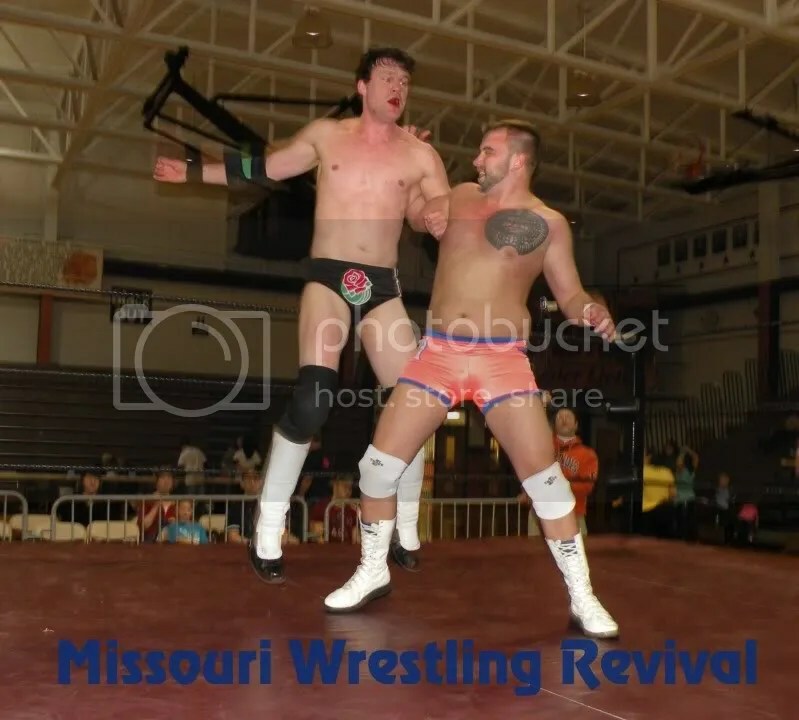 Jeff Harris and Aaron Matthews came to the ring to help even the odds for Vendetta. 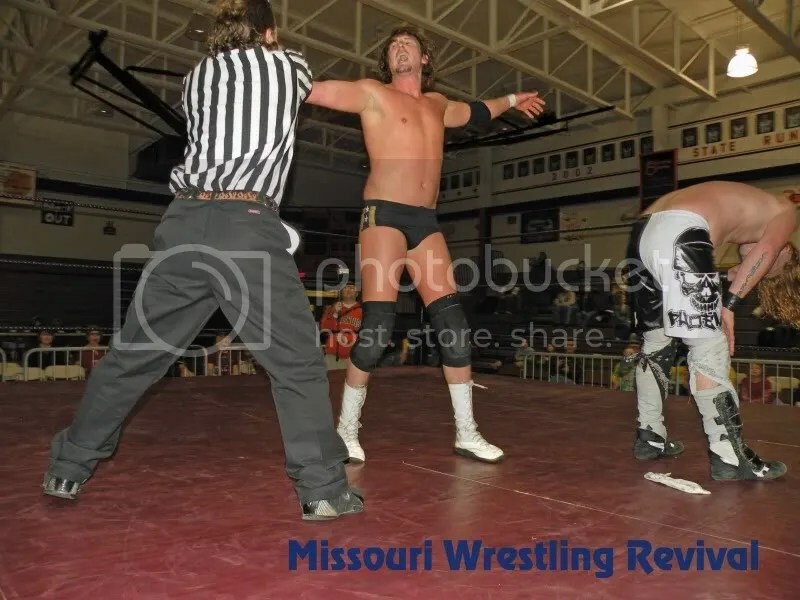 While the referee was busy dealing with Serenity, Aaron had set up a steel chair in the corner of the ring for Vendetta to use to his advantage, and that’s exactly what happened. Vendetta used Harkers Head as a battering ram right into the steel chair, but Harker just wouldn’t quit, kicking out of the pin at a 2 count. It was another foreign object though that spelled the demise of BHD. 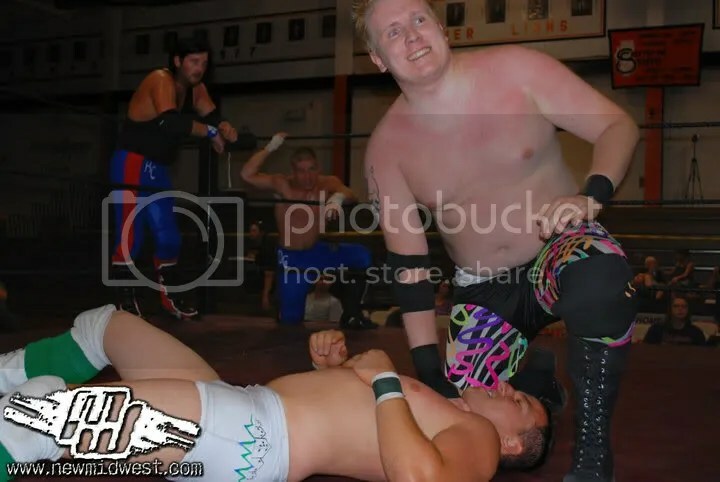 While referee Tally was busy with Jeff and Aaron Serenity had gotten a pipe wrench from underneath the ring and slid it into Vendetta who then used the wrench to clock Harker right in the temple knocking him out cold. Vendetta went for the cover and got the 3 count! Winner and new NBWA Heavyweight Champion: Jason Vendetta. What a day it was at The New Breed Gym, four title changes in all, two betrayal’s, and six brand new faces in the ring! We welcome everyone to join us on Saturday, February 7th for “Pick Your Poision” begining at 2:00 PM. Go to NBWA Myspace for more info.